The Maidenhead, Slough & District Branch of Cats Protection is on a mission to reduce the numbers of unwanted stray and feral cats in the area. Free neutering vouchers provide a solution for cats with owners who cannot afford the cost, but this does not solve the problem of stray and feral cats – trapping and neutering is the only way. Our fieldworkers are out in all weathers capturing these cats, taking them straight to the vet for a quick neutering operation and returning them to their familiar environment. They like the outdoor life and, providing we are satisfied that there is an adequate food supply and someone who is prepared to keep an eye on them, it is often the only solution. There are feral cats living rough throughout Slough, in people’s gardens, behind shop premises and on the trading estate. 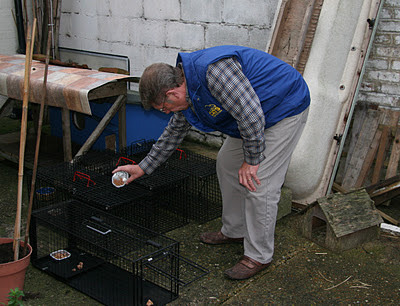 In a recent, ongoing project, we were asked to neuter a small colony living in a back garden. The householder was happy to feed the six adults and 11 kittens, but no more, so fieldworker Ray acted to control the situation. It was an early start as it’s important to be in position before the cats are fed. Ray had four traps – the maximum he can get in the car – which he primed with food then remained out of sight. As each trap closed, he quickly removed it and covered it to keep the cat calm. After a lengthy wait in the cold and drizzle, all four traps were full. Two black kittens, one black and white and one tabby were taken to the vet. Later in the day the four cats, which were all male, were returned and rushed out of the traps none the worse for their experience! Ray returned two days later and trapped a further three adults, this time all female. As one adult cat was already neutered – a notch in the ear identifies that cats that have been ‘done’ – and some of the kittens too immature, just two adults and one kitten remained to be trapped. Ray will return in a couple of months to capture the remaining kittens. A good job done and one that is of real benefit to both cats and humans. But this work is expensive in both time and money. If you can help with a donation towards our feral cat neutering programme, please send a cheque made payable to Cats Protection Maidenhead Slough & District to CP Treasurer c/o 44 Switchback Road South, Maidenhead SL6 7PZ or online at www.maidenhead.cats.org.uk. The problem is likely to increase as the financial situation gets worse so any help will be much appreciated. I strongly feel all cats, and dogs too for that matter, should be neutered except in the case of bone fide breeders who can guarantee homes for their cats', often pedigree, offspring. The thought of a healthy cat or kitten being put to sleep just because no home can be founf for it truly upsets me. Come to Ukraine....see how much cats and dogs kill not humane way....World need know about. I have six adult strays and currently 7 new kittens on my doorstep every morning. I have tried to gt help from RSPCA but they always say they will ring me back and never do. I was advised that vouchers would be available for the neutering but I would have too trap them and take them to the vets and later collect them. I am 80 years old and cannot cope with this. I bought a trap but that is as far as I can get. PLEASE HELP ME.